There are many techniques that purport to make visible what is really going on in an organisation, how its heart really beats. 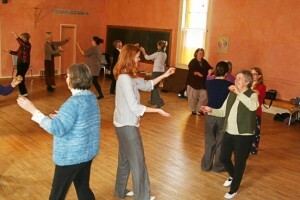 At Thinking we have been experiencing some powerful ones, including social eurythmy. Most organisations use some sort of system of KPIs. If anyone pauses to look and think, most of these measures are superficial proxies rather than “key”, are constraints on performance rather than measures of performance (that is they misconceive what “performance” is), and they are less “indicators” than targets. In fact, if you want to know what is wrong with the management of an organisation, you often need look no further than how the KPIs are not what they say they are. Similarly, most HR departments regard the individual as the key unit to be recruited, appraised, trained, exhorted, turned into “leaders”. How well an organisation functions is more related to social connectedness, patterns of interaction both internal and with customers and other stakeholder groups. What matters is often whether people know who to talk to about issues that come up and whether they feel they have permission to do so. Then there are models of how an organisation is and should be. At Thinking we use a cybernetic model called the Viable System Model. Not surprisingly it models what functions and connections are necessary if an organisation is to remain viable when the environment changes. We can quickly tell if certain things in our organisation (or yours!) are missing or not functioning. Interestingly this modelling can explain common people problems such a micromanagement and turf wars. Like all the best diagnostic tools, this one often works by mending things to demonstrate that they were broken. The International Bateson Institute takes the view that you can tell when the system you work in is learning. And we agree. You know absolutely when it is stuck, and when it is learning you feel alive and even joyful, on an adventure. After all that negative preamble, this finally takes us nearer to the heartbeat. How alive do we feel? A really simple window on the world first. There is an activity called mystic numbers, in which a group of people attempt to count up to 50. No signals, no patterns, just understanding when it is your turn to speak. Groups can learn how to do this, without anyone being able to articulate what is being learned or how it is being learned. It seems that anxiety, never far away at work, is an inhibitor. The group ability and potential becomes quite palpable. Eurythmy is already a century old but still little known. In the eighties a form of social eurythmy was developed specifically for organisations and groups. One of our partners, Heidi Pedersen, has a formal training in the techniques, and the training is long (years) and serious. Without trying to teach you how, eurythmy consists of a groups of people forming dynamic patterns, often involving passing a set of balls between them as they move. Someone observed at the last session that you can’t do it from your head. You can’t think your way into what your body already knows. You can’t do a survey to access what the organisation knows about its own operation. The more you think you can, the more you are blinding yourself. The head and the heartbeat are often at odds of course. We convince ourselves that the world works one way when our bodies know the opposite. If you want a detailed exploration of that principle you could go to Marion Milner, On Not Being Able to Paint. So out into the dynamic patterns of eurythmy come working relationship issues that are fully hidden from conscious view. The connections that form the patterns come into awareness in a bodily way. If that sounds strange, think about the way organisations inhibit that sort of living knowledge, and privilege knowing that is ultimately trivial and superficial. The organisation has a heartbeat that expresses the ways in which it lives, and the patterns of eurythmy express in some way how the people carry the heartbeat between them. Both the beauty of the patterns and the way they break down are important. The feelings evoked in the process are important. And people describe an increase in creativity following sessions. Again the diagnostic is already part of a revivifying. In our recent session, Heidi was gently asking us to be gentle. She asked us to receive the balls from ourselves hand to hand and from others with some grace. How many organisations focus on the grace of giving and receiving, those everyday gestures. How do you feel about living in an organisation where grace is unimportant? No-one ever fattened a pig by weighing it, indeed a pig may fail to thrive if it is being weighed all the time. But there are learning systems that thrive by intensive observation and discussion. What can you do that gives you an enlivening window into how you are as an organisational system?